Dambisa Moyo is a name you may be hearing quite a bit more of in the coming months. She is a smart, articulate, young economist with an impeccable academic background (Oxford and Harvard) and ten years working in investment banking and development finance (Goldman Sachs and the World Bank). 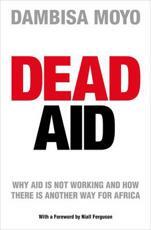 She has recently published a book entitled Dead Aid which slams the culture of state donor aid which she feels has held Africa back since independence. Although based in London, she also happens to be Zambian and last week I was fortunate enough to hear her debate the issues here in Lusaka. Tellingly the event was organised by the British Council and not the Zambian government, but to hear topics of development and aid being discussed openly and frankly by a room of Zambians and NGO/donor types was a wonderfully eye opening experience. Dambisa’s central thesis is that the continent has little to show for $1 trillion pumped into it since independence. Worse, despite the best intentions of all those donors, the aid culture has directly contributed to the dysfunctional level of government experienced in many African countries to this day. One of her most compelling arguments is that aid disenfranchises the people it seeks to help – the general population. In developed countries, politicians are elected (and kicked out) on their ability to provide schools and hospitals, upkeep roads and the like – yet in many African nations these public goods are funded directly by donors. Other international governments are no substitue for a broad base of African tax payers to focus politicians minds, come election time, on their ability to serve the whole electorate and not just their tribe or inner clique (or simply keeping the donor community sweet). And therein lies the rub, although many of Dambisa’s criticisms focus on aid and donor policy, time and again her fundamental charge is against the government’s of Africa. They have, in her words, failed to provide the leadership to deliver better lives for Africans. Better leadership externally in the terms of trade they should demand from investors and wealthier trading partners. Better leadership internally through strong governance to end corruption and limit bureaucracy – the real barriers to economic development and prosperity. We happened to be meeting on a day when a junior Zambian health minister had been accused of siphoning $2m for luxury 4×4’s and holiday guest houses. Her big idea is that the international community should set a fixed date for all aid to stop, say perhaps by 2020. During that time donors could double, triple, quadruple aid if so inclined, but the clear signal that this endless flow of money will one day cease would be sufficient impetus for African governments to begin planning seriously for a truly independent future. Can all this be achieved or is it mere ‘pie in the sky’ wishful thinking? She gives the example of Paul Kigame of Rwanda, an ardent critic of aid culture. He has instituted a number of reforms including setting a fixed timetable for reduction in aid; insisting that all members of his government can only receive healthcare in Rwanda; limiting the number of official state vehicles to five and the amount of free phone credit given to government officials each month. Small steps perhaps, but each was greeted with gasps of incredulous appreciation by the Zambian audience. Tellingly, he notes that only a country who knows what it feels like when the international community turns its back can truly understand how important it is to break free from the culture of aid dependency. Her points are clearly not new, in fact she dedicates her book to an Hungarian sceptic of aid from the 1960’s, and at a certain level it doesn’t matter whether all her points stand up to the harsh light of economic reality. The fact that a young African woman is provoking the debate is cause enough for celebration. One of her first barbs in the book is directed at the culture of ‘celebrity aid’. Why, she asks, do aging Irish rock stars have more to say for African development than anyone from the continent? There are rumours of an upcoming appearance on the Oprah book club. If they are true, she can expect to have to deal with a little bit more of the celebrity culture herself, but perhaps we can all expect some very big changes in the tone of policy debate if her thoughts hit middle America’s sitting rooms.